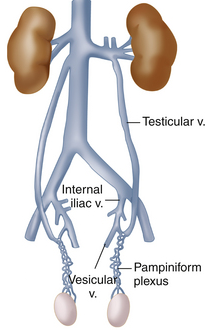 "Código de procedimento de laqueação da veia espermática, uma vez que não há entrada direta e a laqueação da veia renal, dá um alerta"
136 On which side do varicoceles more commonly occur? 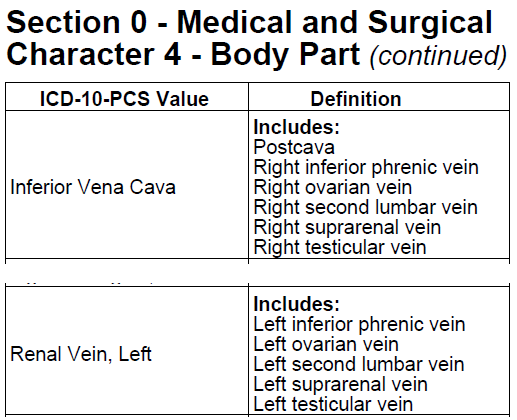 Where a specific branch of a body part does not have its own body part value in PCS, the body part is typically coded to the closest proximal branch that has a specific body part value. In the cardiovascular body systems, if a general body part is available in the correct root operation table, and coding to a proximal branch would require assigning a code in a different body system, the procedure is coded using the general body part value. Examples: A procedure performed on the mandibular branch of the trigeminal nerve is coded to the trigeminal nerve body part value. Occlusion of the bronchial artery is coded to the body part value Upper Artery in the body system Upper Arteries, and not to the body part value Thoracic Aorta, Descending in the body system Heart and Great Vessels. Example: A procedure performed on the alveolar process of the mandible is coded to the mandible body part. Não foi referido qual o alerta emitido (pelo SIMH). Provavelmente será o agrupamento num GDH de exceção. Seja o que for, depois de se verificar que não houve erro de recolha, o alerta deve ser confirmado e o episódio encerrado.